The Moon Warriors is one of the few films which I have a very fond memory of from when I first started getting into Hong Kong cinema, when I used to watch pretty much only martial arts films. Back then I had no idea who any of the actor or actresses were, I may have just recognised Maggie Cheung as being Jackie Chan's girlfriend in the Police Story series. 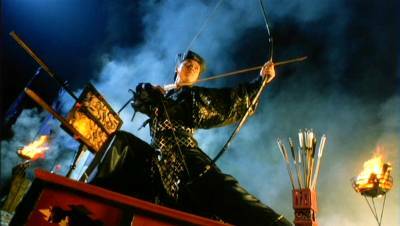 I've come along way since then, but recently re-watching Mei Ah's newly remastered release of the film brought back quite a few memories, reminding me that there is nothing quite a like a good over the top swordplay flick! Like most action films, the plot isn't particularly meaningful or complex. Everything is simple and generally linear, and basically tells a straightforward story that serves to set up the next action scene. The successor to the Emperor's throne is Yen (Kenny Bee), but he has an evil rival for the position who wants him, and his followers, dead so that he can take the throne himself. With assassins hunting him down, Yen and his small group of loyal followers flee. 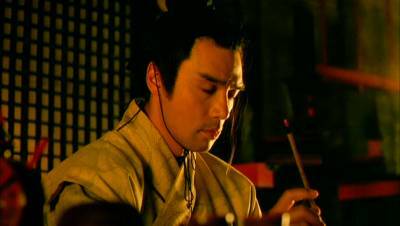 However, they are caught in trap but are rescued by Philip (Andy Lau), who is a master swordsman, but also a humble fisherman. 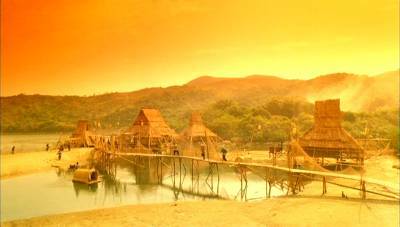 Needing somewhere safe to stay, Yen and his group agree to take refuge in Philip's village, but don't immediately reveal their real identity. 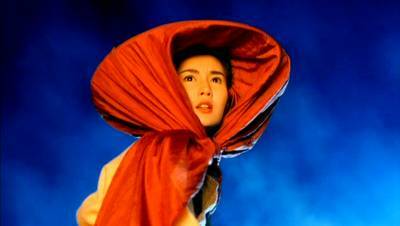 Knowing that his rival will do whatever it takes to capture and kill him, Yen asks Philip to go with his companion Merlin (Maggie Cheung) to Lord Lanling, whose daughter Moony (Anita Mui) is Yen's fianc�e, in order to protect her. No sooner have they got there than an assassination attempt is made on Moony, highlighting the fact that they have to return to Yen as soon as possible for their own safety. On the way back though, a close relationship grows between Philip and Moony, as the two have to fight to survive the trek home. Yen's rival, however, is relentless in his determination to kill them all, and he has a few surprises that will aid him in tracking them down. Well, that's not really a great plot summary, but that isn't really that important. What are important in the film are the action scenes. With one exception in the 'Wow!' 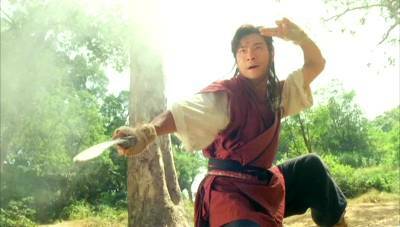 factor for watching a scene, the fight scenes are the main selling point of the film. There are plenty of them, and the range from the quite ridiculous to a little more realistic, but in every case they are great to watch! The opening fight is the most ridiculous in my mind, as it features the types of elite assassins that are able to bury themselves, and then run/move around underground! It is quite funny when you see lots of bamboo poles starting to move, but it is just a tad unbelievable! Pretty much all of the fights that take place are weapons based. The weapon work on display looks very good, and quite complex most of the time. There has been quite a bit of under cranking (speeding up the film) in a lot of the scenes to make it look faster and better. Sometimes this is blatantly apparent, as the moves are just too fast to have been done that way, but at other times it compliments the on going action. Despite this adjustment, none of the fights were boring, and each had something unique about it to make them all exciting and entertaining to watch without giving a feeling of "seen that before". 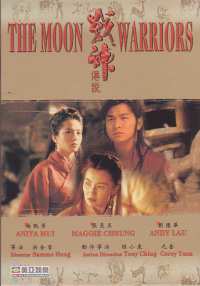 Of all the main actors and actresses, none of them that I am aware of are properly trained martial artists, but they are made to be very believable in The Moon Warriors, Andy Lau in particular. In several scenes, if you look reasonably closely, it is quite apparent that Maggie Cheung and Anita Mui are doubled for some of their fight sections, but this doubling has been done very well, so it does not distract from the entertainment. Andy Lau, though, really impressed me. Granted he has done quite a number of films where he has had to do some weapons work, and I'm guessing he has done some martial arts training in his acting career (he can do the splits! ), but he still pulls of some very cool looking moves in The Moon Warriors. He handles his sword well, and in the scenes where his village is being attacked, he is agile and co-ordinated enough to perform lots of jumps and kicks and the like on the bad guys. A few paragraphs ago I mentioned that there was an exception to the fights being the main selling point of the film. 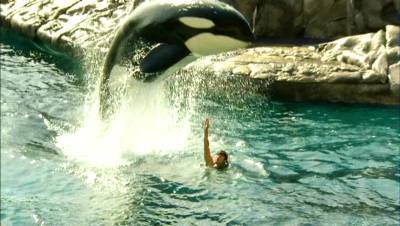 For me that exception is the scenes with Andy Lau and the killer whale! WOW! There are scenes in The Moon Warriors where there is a real live killer whale on set, and Andy Lau's character has a lot of interaction with it. The highlight being when he is playing with it in the sea. Now in those scenes in the sea it still looked like Andy Lau was playing Philip, not a double. If my eyes weren't deceiving me, and that really was Andy Lau, and what you saw going on is really what was going on, no camera tricks or the like, then Andy Lau is one lucky b@st@rd! He got to swim with the whale, do a few tricks with it, like standing on its nose while it jumps out of the water, and generally just have what looked like it must have been an absolutely incredible experience. Despite hating water sports, and water in general (not drinking it though), I was very jealous of what I was seeing! Those scenes were stunning. Anyway, enough of that, onto what is the weakest part of the film: The acting. With a rather star studded cast, I have to admit that I was a little disappointed with the acting in The Moon Warriors. Each of the actors and actresses is more than capable of acting superbly, but they all had comparatively off-days while making this film. No one person shines as giving anything above an average performance, as no one gives anything memorable in the good sense. 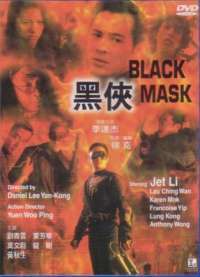 Unfortunately, and quite surprisingly, the most memorable feature of anyone's acting was memorable in the bad sense, and it came from Andy Lau. There is a scene where he has been badly injured, and his wounds are potentially fatal. Basically he is supposed to be dying, while Moony tries to help him. I've not seen such an unconvincing portrayal of someone suffering and dying in a long, long time. As I hadn't seen the film for quite a while before re-watching it recently, I couldn't remember what was going to happen at this point, which will explain why I actually thought his character was only faking it and was joking about being in pain etc.! That one extreme moment of bad acting aside, everything else about everyone's performances is just rather flat and bland. Little emotion is built up for the characters, compared to what is really being aimed for. Philip is a likeable guy so you do care for him a bit, but the others... not that much really. Regardless, if I was wanting to see a film where caring for the characters was the foremost importance, I wouldn't be watching an action film. I don't really have that much more to say other than for me The Moon Warriors is a classic film. The action is always entertaining, the quirky bits of Hong Kong humour that pop up are quite funny this time, and the film just looks good. It is one of those films that you can go back to for some mindless action entertainment, and I love it! Even though this The Moon Warriors DVD has the original theatrical audio track (DD2.0) on it, I chose to watch the film in the 5.1 soundtrack, mainly to see how decent a mix it was. Most of the effects come from the front centre speaker, with a few spread round the surrounds. It is mainly ambient effects that come from the rears, although the noises of the horses are also spread round, not always when they should be though. Sometimes when the horses are on screen, their noises can still be heard coming from the rear speakers. A few effects also came across as being possibly a little muffled sounding. The swords didn't, fortunately, with the sort of *ping* noise that you get from swords in films sounding quite sharp and clear. The subtitles were generally ok. I don't know if they were a new set or just the same as the ones on the previous release, as there were still some spelling mistakes and grammars errors throughout the film. Some text is also not subtitled, and unfortunately neither is the song. While songs are rarely important to the plot, I wish the companies that create the subtitles for these films would realise that most people using the English subtitle track would quite like the song to be translated. The subtitles have also been westernised a little, as Andy Lau's character is really called Fei, not Philip. I don't know whether the names of any of the other characters have been changed though. So both audio and subtitles could be a little better. The film print does not demonstrate all the qualities that you would hope to get from an anamorphic print. Firstly it is still quite dirty, as there are speckles and vertical lines in quite a number of places in the film. In general it also comes across as being a little pale, as the colours do at times look as though they are a bit washed out. Detail levels are varying, as at times the print definitely looks quite soft, but at other times there does seem to be quite a bit more detail evident. It is also possible that the contrast levels aren't quite set right, as I noticed that in some of the darker scenes there wasn't too much in the way of shadow detail. While the print is undoubtedly better than the old Mei Ah release, I honestly was hoping for better than this. 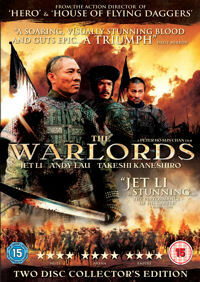 Until the Hong Kong Legends release comes out though, this is still the best on offer for this film. This The Moon Warriors is pretty much a bare bones release. The only extras, if you can really call them that, that you have got on the DVD are the film's trailer and the film's synopsis and list of cast and crew, both the latter two being in English and Chinese. This Mei Ah DVD is, to the best of my knowledge, the finest The Moon Warriors has ever looked. While there is still room for improvement, which is likely to happen when the Hong Kong Legends release eventually comes out, for the time being it really is an essential purchase. The film is pure entertainment, and one that you are quite likely to go back to as well.